Standard - £40.99 Only 8 left! Erm, can we be frank? We're entirely unsure what "Ramma lamma. . . etcetera" means but we bet whatever it is, it goes pretty darn well together. If you and your partner feel like you jive better than a left and right hand then you have something to be proud of. 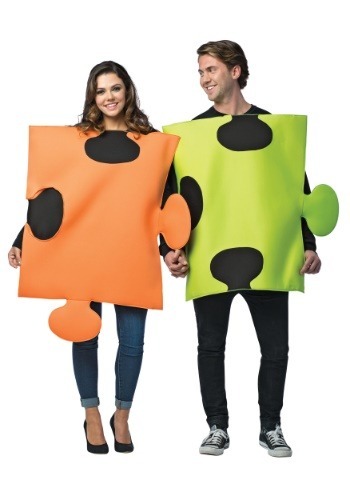 If your partner finishes your sandwiches and you don't even get mad than you two are the perfect match for this bright and adorable costume. Don't just limit yourself to Halloween parties. The vibrant colors of these puzzle pieces make them perfect for finding each other in crowded public places. Where these tunics to that wild annual board game convention you two have been talking about crashing for all these years. Puzzle lovers and Monopoly snobs have had a rivalry for years now so these costumes will shake things up like a Yahtzee cup! We're sure there are other uses for this sweet couple costume. Wear them next time you head to the nursing home to finally finish that two-thousand piece jigsaw of the Oklahoma City skyline that you've been working on with Ethel. An accomplishment like that deserves a celebration more monumental than an extra serving of Tapioca pudding. 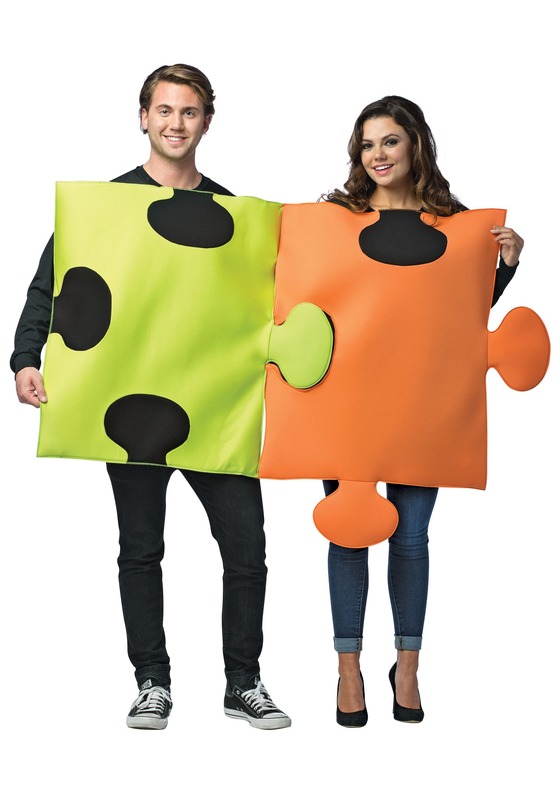 Become couple of the year with this bright costume! You'll get two foam tunics that simply slip over your head for an easy transformation. You know what? We think you two go together better than Ramma Lamma Lamma Ding Dong!